The squares “A” and “B” are of the same color! My color picker swears both are #787878 (Hexa-RGB). But nothing can beat the Koffka Ring! Wow, Amazing.!! I’ve never seen anything like this before.!! How the Mind is tricked.!! I did not get it. How are they the same colour? You can get the dope behind the phenomenon called “optical illusion” from this page. Ugh! I don’t get it! That was so sweet. Of course, when I showed it to my 16 year old son, he was quite familiar with the concept already. Yes, the next generation is way too smart!! Grr…not helpful….are you saying that the Letters A and B are the same colour? 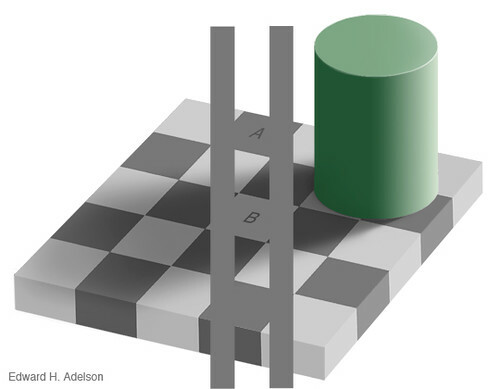 Or the squares on which A and B are etched are the same color? Perhaps I was not very clear. 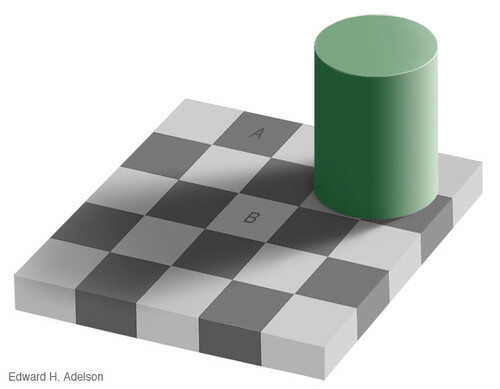 The squares denoted by the letters “A” and “B” are of the same colour. They look different because of the effect of the colour of adjacent squares and spaces on the human eye (and on that part of the brain which actually sees). This phenomenon is termed as “optical illusion”. Perhaps this aberration of the sensory organs is helpful for the higher level functions of overall perception and understanding. Good subject to dig deeper! Ok thanks for explaining, but besides noting that the actual letters “A” and “B” are same, I’m unable to see the optical illusion you explained. I’ve come across quite a few, but this is the first time I’m unable to see IT even after so many explanations! In good humour without offence.